Acrylic on board. Abstract geometric study, signed and inscribed on verso. Keith Wood was born in Bolton, and studied at Leeds College of Art. He was senior lecturer and course director at Blackpool and Fylde College of Higher Education from 1964 to 1986. Wood has work in many public and private collections. His paintings are a great example of British Op Art. Op art was a major development of painting in the 1960s that used geometric forms to create optical effects, which ranged from the subtle, to the disturbing and disorienting. Op painting used a framework of purely geometric forms as the basis for its effects and also drew on colour theory and the physiology and psychology of perception. 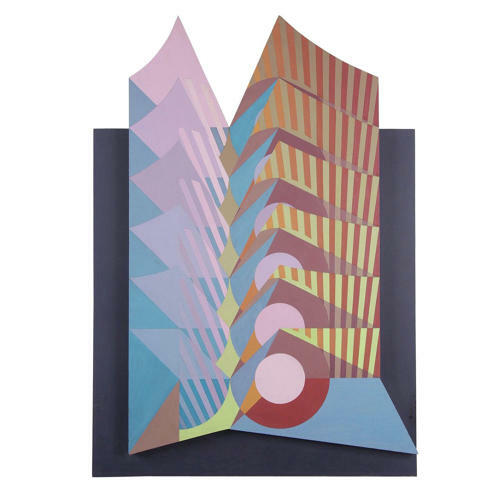 Leading figures were Bridget Riley , Jesus Rafael Soto , and Victor Vasarely . The phrase ‘Op Art’ was coined around the time of the famous ‘Responsive Eye’ exhibition MOMA 1965, with ‘Op’ of course referring to optics – the physical and psychological process of vision. Work on the mathematical and scientific basis of perception had been ongoing since the 1800s, with much progress having been made in the 1950s and 1960s leading to a resurgence of interest in the field. The Op Artists, through their study of the science behind how the eye and brain work together to perceive color, light, depth, perspective, size, shape, and motion, were able to put into practice the scientific work around visual perception. Op Art exploits the functional relationship between the eye’s retina and the brain. Certain visual stimuli can cause confusion between these two organs, resulting in the perception of irrational optical phenomena, something the Op Artists used to full effect.